Wanxiang Group Automobile Parts Laboratory is a member of Wanxiang Group. The area of Lab is 28,576.8 ft2. This Lab was founded in 1997. It has been a leading Automobile Parts Lab. 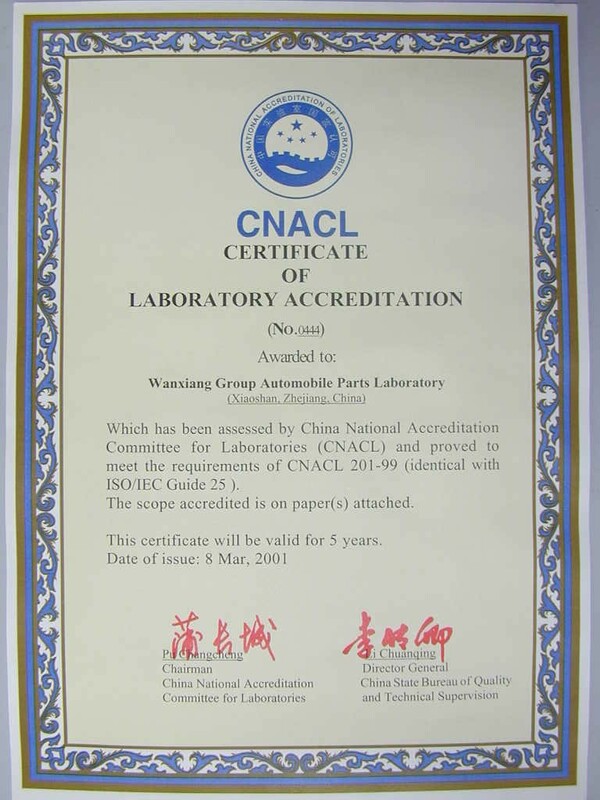 In March 2001, it was awarded a national certificate by China National Accreditation Committee for Laboratories (CNACL) which are agreed by 37 countries. So national automobile factories and other foreign factories accept test results of Wanxiang Group Automobile Parts Lab. Wanxiang Group Automobile Parts Lab has the following capabilities: test and analysis for material; test for drive shaft, U-joint, constant velocity joint, shock absorb, bearing and brake; some high precision measurements for parts. In order to meet and exceed customers’ requirements, we are constantly developing our lab and improving our technology level.